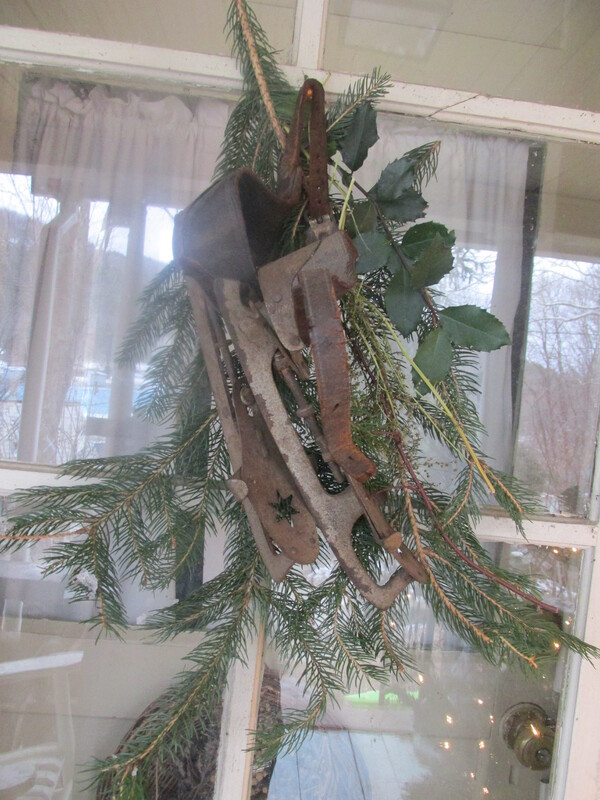 A wonderful CHristmas was had here on the farm with most family members here, Tea’ and her father were sick with the flu so they stayed home. It has been a while since the whole family had gotten together. The day after CHristmas I came down with the horrible flu. It has been going around in the central and eastern part of the state, closing schools in its wake. I am much better now and went down toGreenfield’s co-op and got some immune boosters. My immune system needs boosting from the last bout of sickness I had. I hope my flu shot will cover me for other things that go around. I have been lucky to have Chris helping me and my son getting me things to drink at the store. There was a brisk wind today on the Greenfield Platform. The train was a little late in coming. I got there about a half hour early and there were only a couple of people there, close to the arrival time the numbers swelled and there was hardly room to stand. It came through the small tunnel sounding it horn and the crowd roared. There still are many diehard train lovers here. 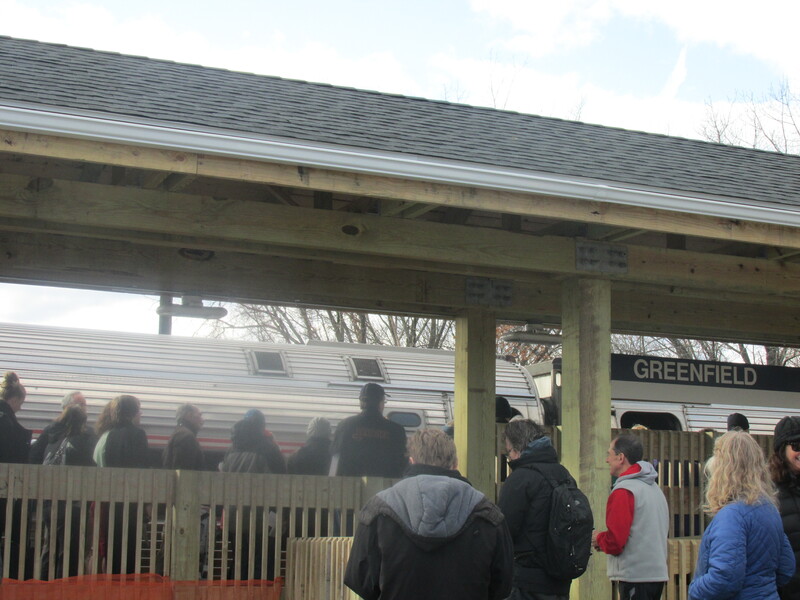 The train was sold out with many people taking the last train to Amherst yesterday and the first train from Greenfield today. In retrospect I wish I had done that. I would like to take the train to Noho once a month. Even if I don’t have errands to do it would be a welcome change to my routine and I could even meet a friend there, How about it Patti? 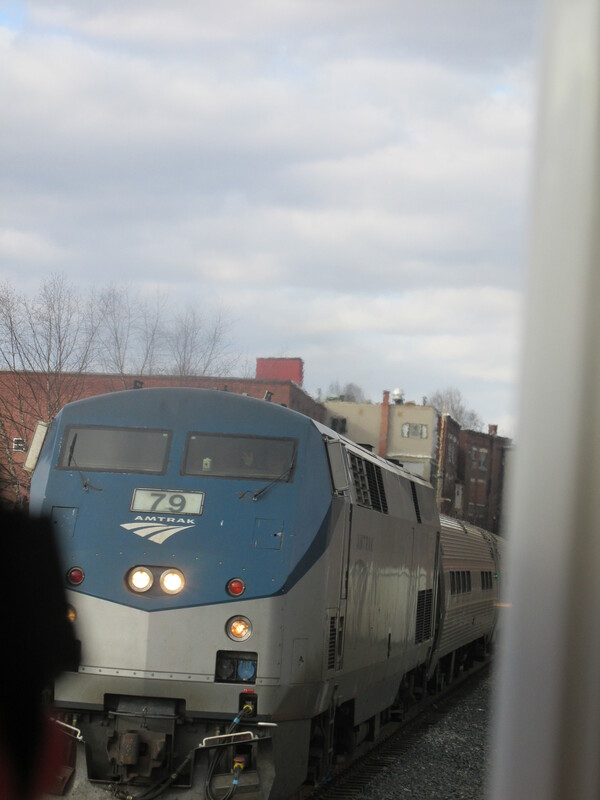 The ride to Northampton is only around $6.00 roundtrip (so a friendly train lover told me) and there is time to get a lunch and do a little shopping before getting the next one back. The ride winding around the river will be spectacular. 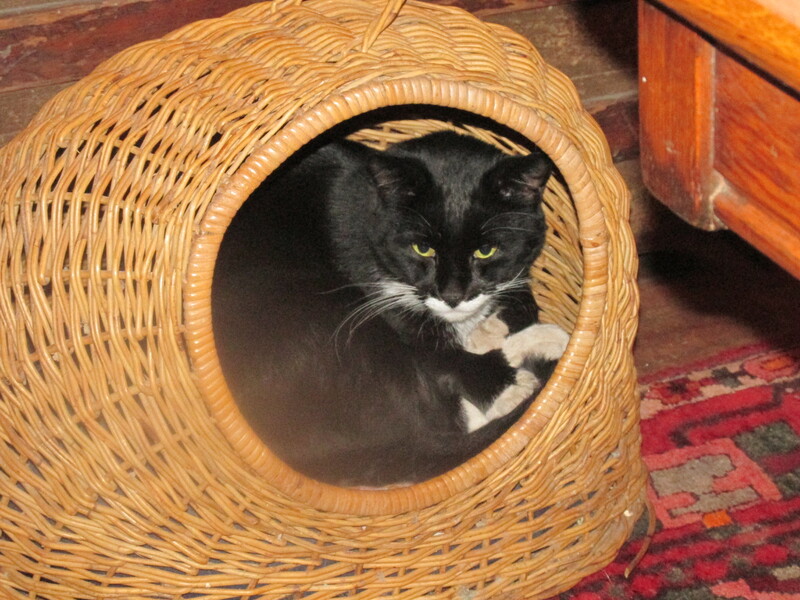 Sam is a lot like my old Sammy, No one but himself slept in the kitty hut now I find the new Sammy in it happy as a clam to find a quiet spot. 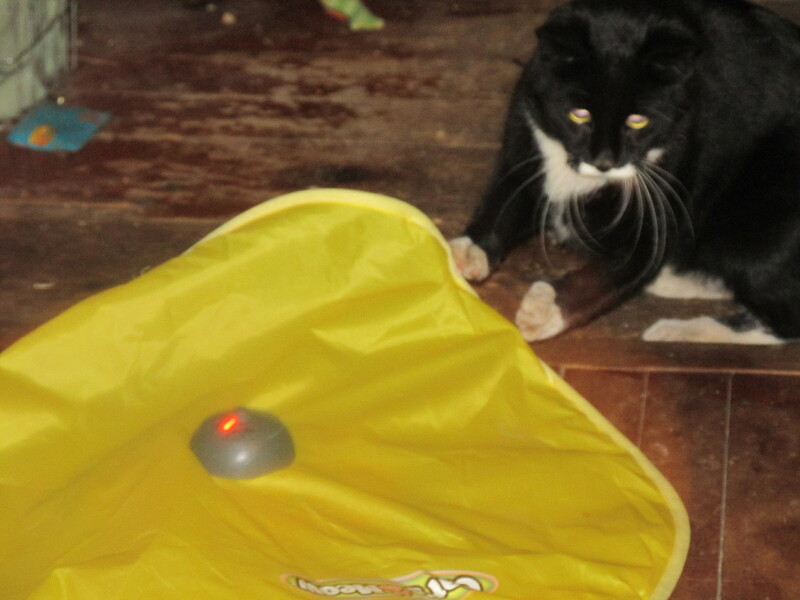 Chris bought a toy for his cat but Lilly Pad didn’t like it, Sam got right into it. 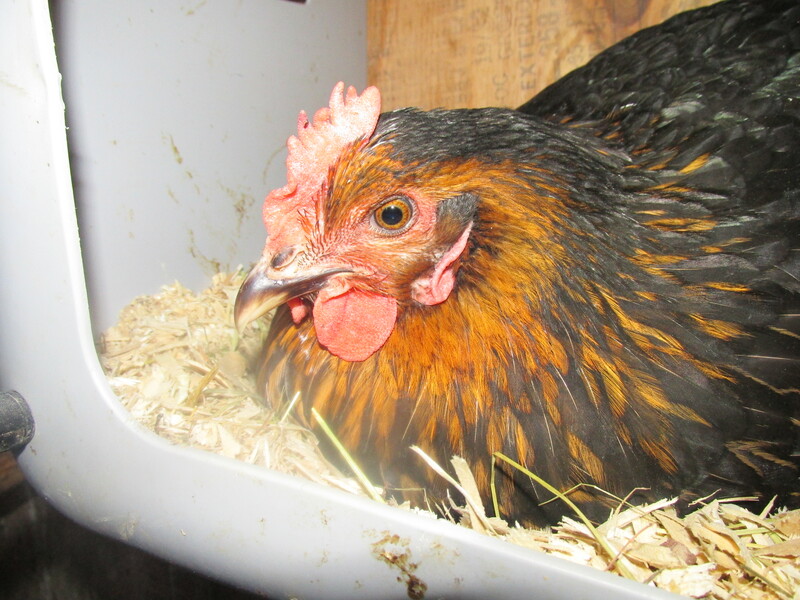 Matilda has been busy laying an egg every day. I have been getting more eggs lately Yea! 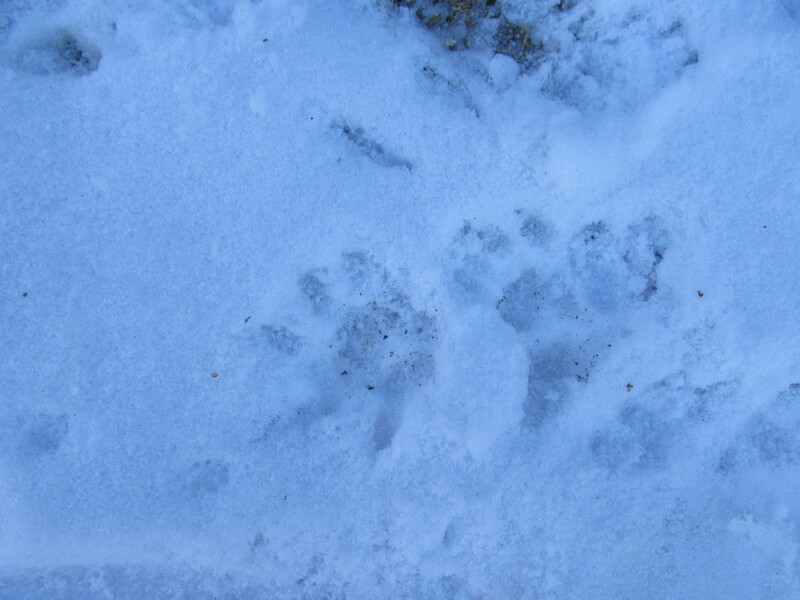 We had a touch of snow this morning. 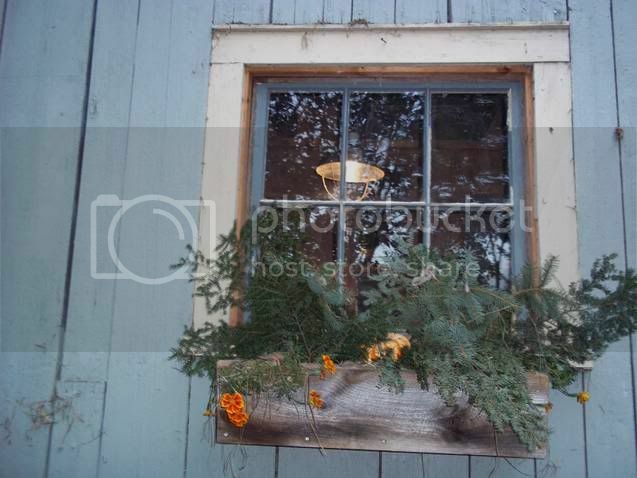 The hemlock tree outside the top of the barn window looked beautiful. Its raining now and its suppose to turn into sleet later on. Then warm weather coming in. I saw these on the internet and thought it would be fun to make. I thought I would put a pocket in the back to hold candy canes, it didn’t work out so I filled it with balsam and added a hanger. I made another one which isn’t finished yet. They were fun to make but ended up being more work than I thought they would be. 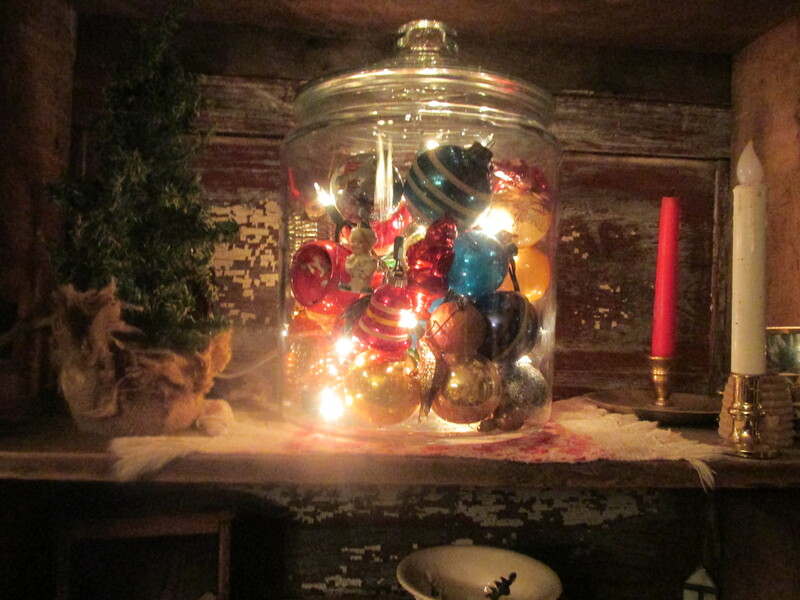 I keep some of my oldest ornaments in a large glass jar and this year I saw people lighting up ornaments in jars so thought I would do it too. I do love the effect . 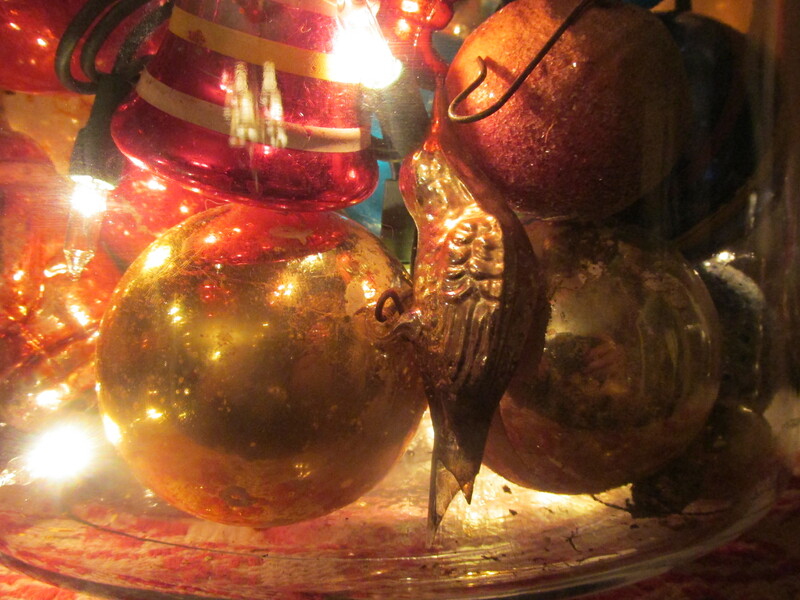 These ornaments are very old and many of them were on my Grandparents tree. I love seeing them it brings back fond memories. I have had these wonderful old skates for many years. I remember paying 25 cents for them at a flea market. They have bought me a lot of joy. Just looking at them I can see someone skating on a lake in the early part of the 20th century. I used to take my children skating on Bray Lake at the Mount Tom Reservation. I went there too as a child, skating. There would be fires to warm you up. What fun. I don’t hear of skating much anymore, just indoor rinks. 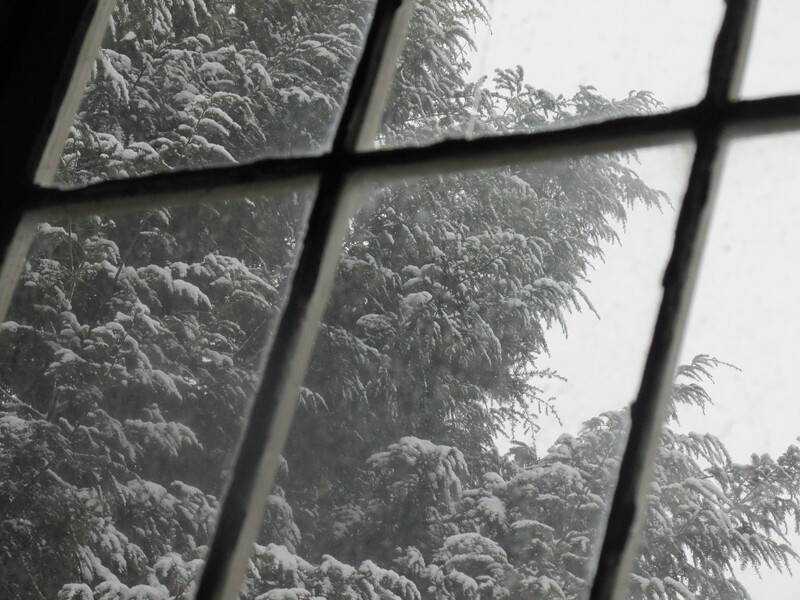 Usually by this time the snow is up to the outside door of the chicken coop. They were out yesterday and will be out today. I still want to have a greenhouse set up for them and will try to plan it this winter. I do have some windows and it could attach to their door area. 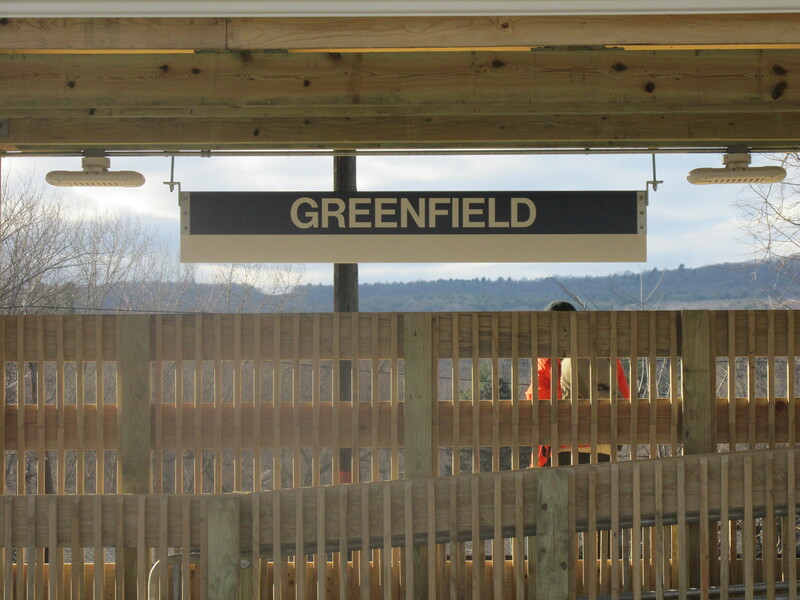 Amtrak will be stopping in Greenfield for the first time in many years. The tracks are fixed . If the weather is good I plan to be there when the train pulls into the station. I would like to take the train to Springfield sometime this summer. The scenery along the Connecticut River will be spectacular. Sadly though they are not redoing the old Holyoke station and have put up a box type thing for a station. It was a beautiful station in its day. It’s too bad that it couldn’t be fixed, the government spends it money on many other foolish things this would be much more inviting to tourists. Another great event is that FINALLY happening The Vermont Yankee Nuclear power plant is closing. A dangerous plant where its owners don’t even live around here. I am still in the danger zone and will be till the plant is totally dismantled. But its a step in the right direction. 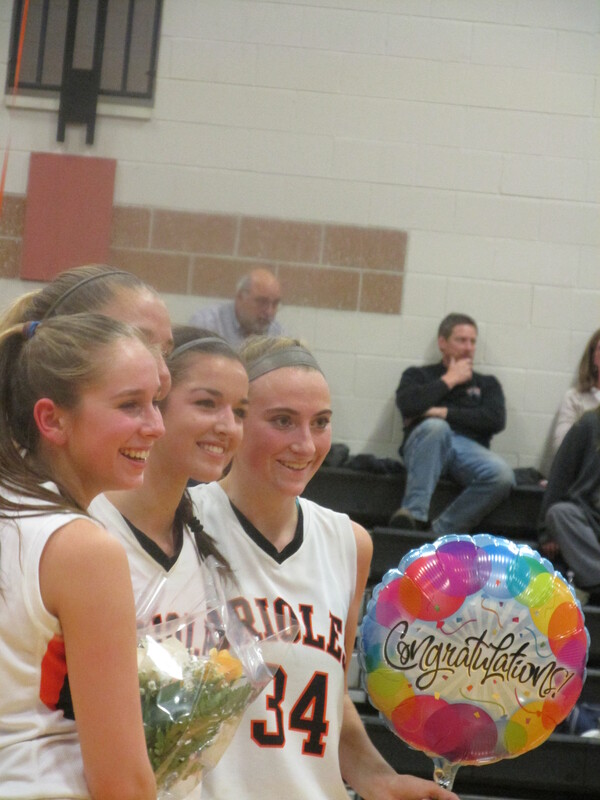 Making 1000 points is quite a feat and only three girls have done it. Last night was a glorious night for our family and for the school. Tea’ scored early in last nights game and the game was stopped. Two banners were dropped, many pictures were taken and friends aNd family cheered. She will continue on at Babson College in Wellesley, Mass. next fall. Yea Tea’. 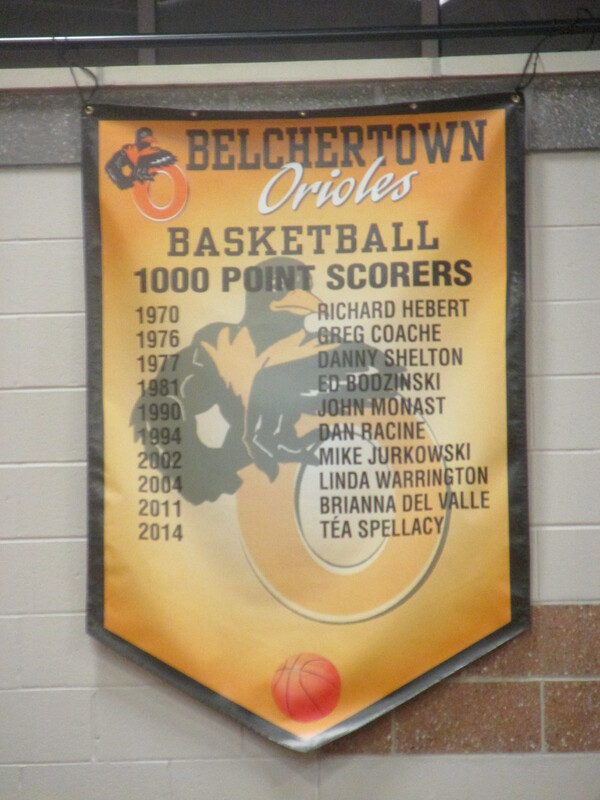 My Dad would have been so proud of Tea’ as he loved basketball and played many games at the Holyoke YMCA. Hazel is doing a little better. He is getting treatments twice a day and plenty of thyme and basil in his diet. 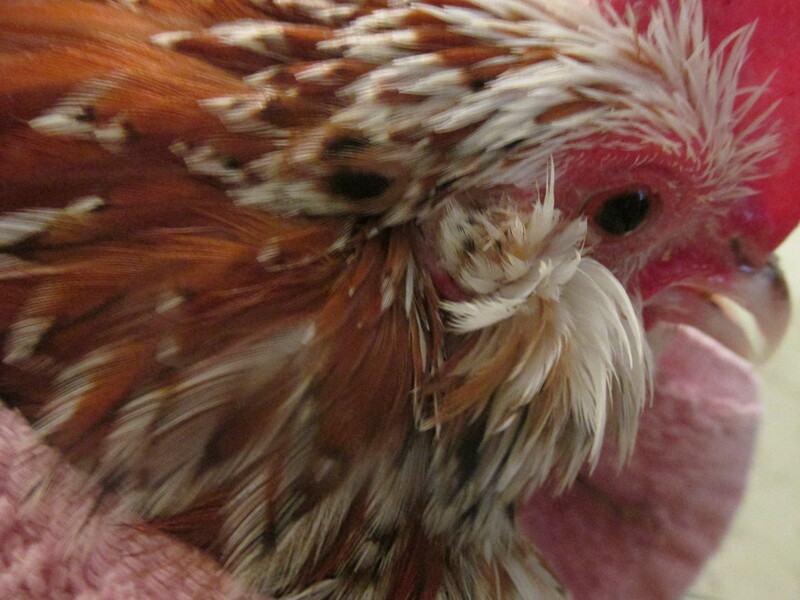 He hates the treatments which are really nothing more than putting some VET RX on his nose and under his wings and he is still quite feisty! We will be getting some sprinkles today and it will be in the 40’s. Rain overnight and good for a few days. 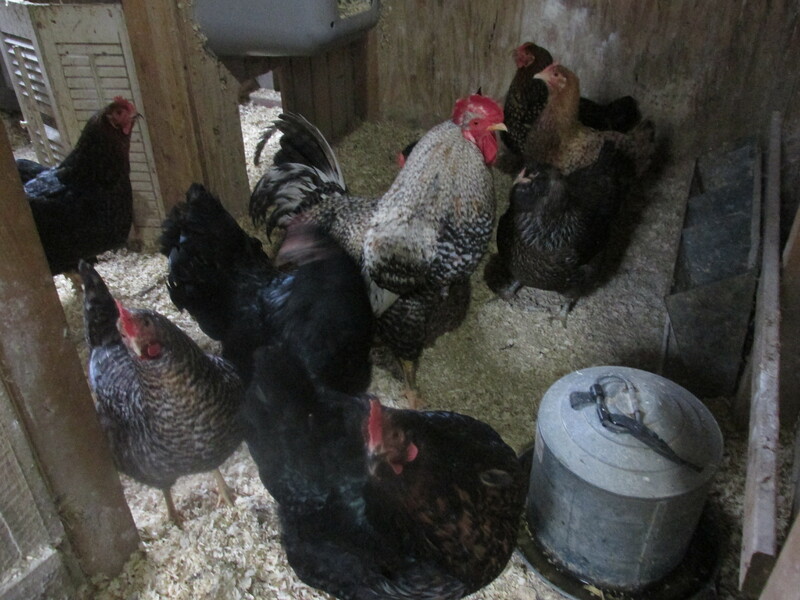 This gives me a wonderful chance to clean out the chicken areas and the barn. It was a beautiful day today, sunshine and warmer weather. Poor Hazel has started with the funny crow and sneezing. I decided to bring he and Mrs. Brown in right away. They are comfortably settled in the upstairs bathroom. (Hardly used and secure door) He did so well this summer I thought he would be fine but this is something I think I will do every year . Tomorrow I will pick us some fresh herbs and some Vet RX and I have started them on a 19 course of antibiotics.. These two are like an old married couple. They talk to each other all day long, there has been much conversation with this move. 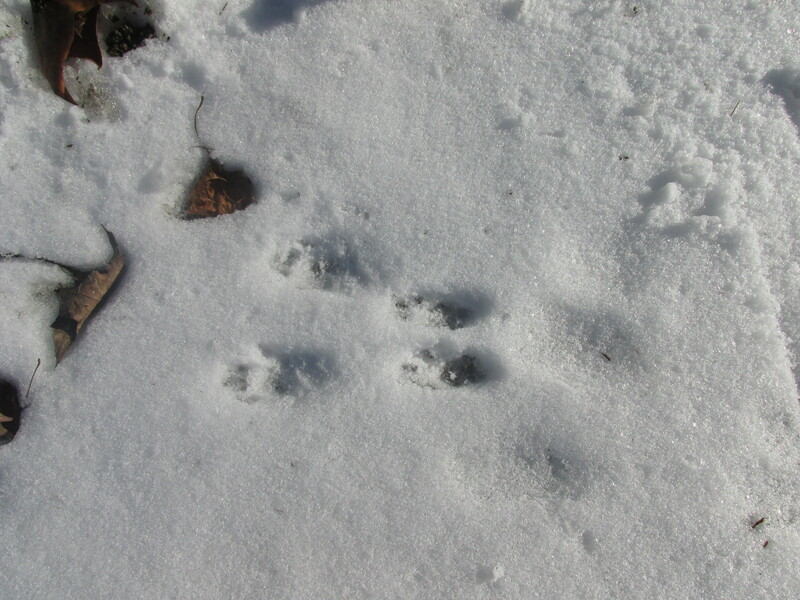 Today i spotted lots of tracks in and around the bird feeders. They weren’t there yesterday. Some I can identify but others I wonder . 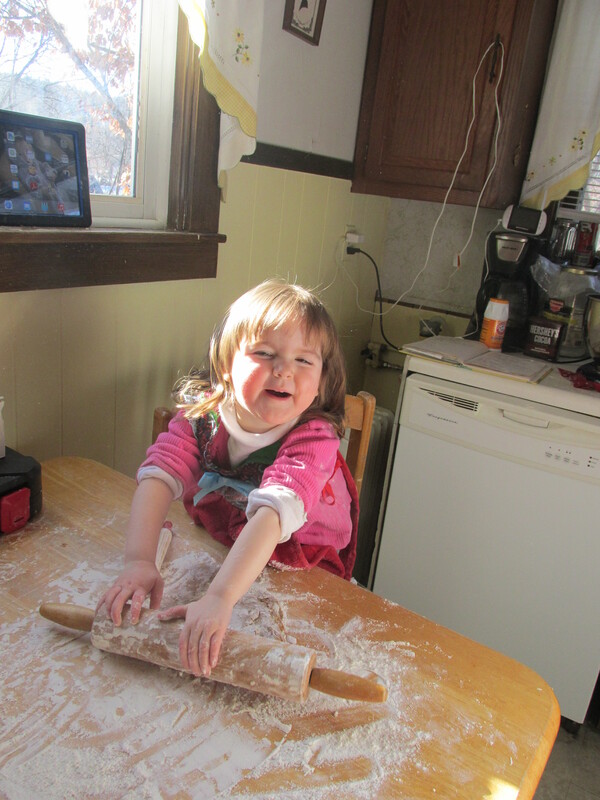 Lil got some baking pans and a rolling-pin for her birthday and today she was quite busy in the kitchen. Making cookies and eating them too. It’s a frigid morning here on the farm. Ice in the chicken water. Oatmeal is cooling to warm up their tummies. 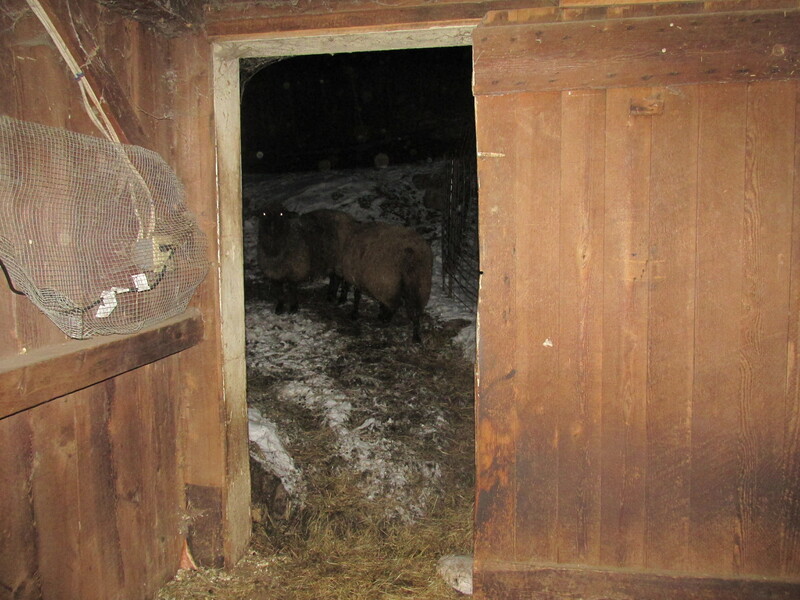 SHeep are comfortable with their warm coats. Cats curled around the wood stove. All is well. On Sunday morning I went into the coop and he was slumped in the corner. His comb was very pale for months now, but he was active and running around and eating well. I really wonder if there wasn’t something wrong, only he seemed fine. Mr. Peppers is looking for him. He is lonely. I called up The CHicken Man and made arrangements to get a couple of hens. I went down just as dark was approaching. The smell of wood smoke was wafting through the air. He lives about 10 minutes drive from my house in a remote part of Colrain. I love the drive the scenery is spectacular even at that hour. 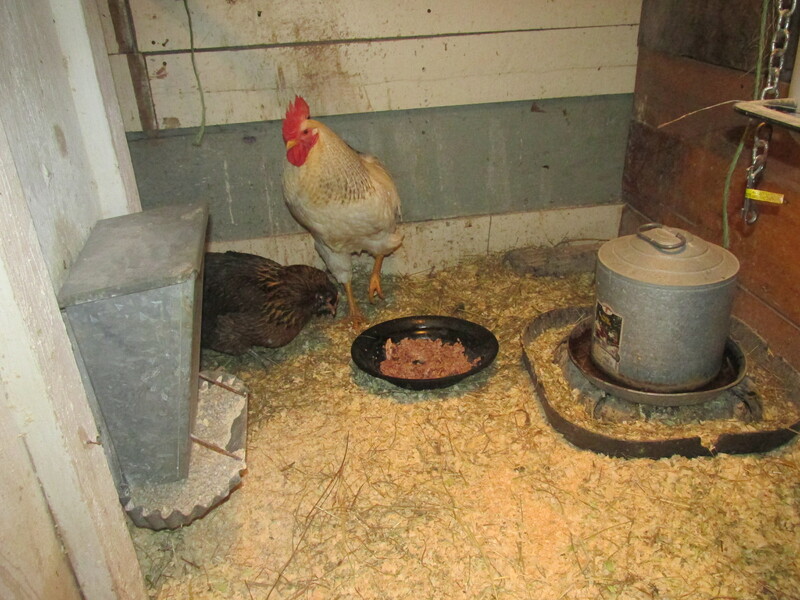 His coops are sparse in the winter, but he had a few cute bantams and other hens that will be laying soon. 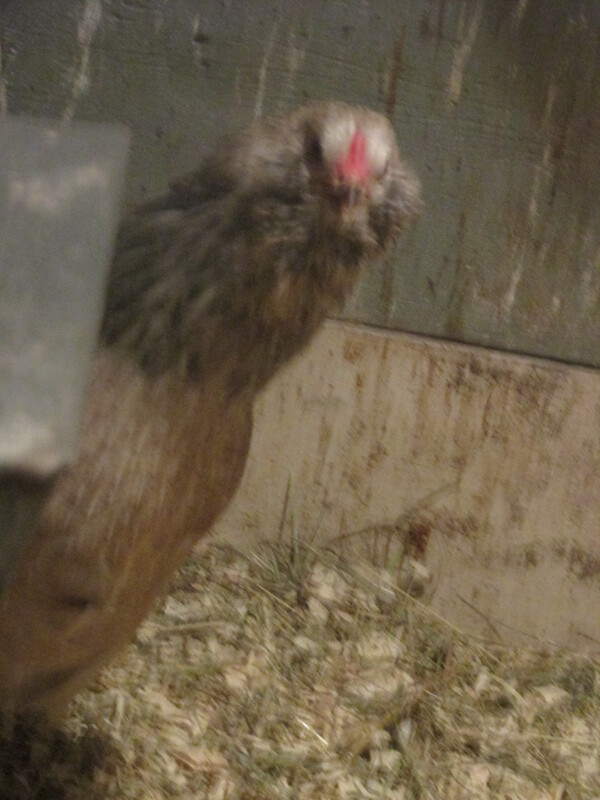 I bought 2 araucana’s so there will be a few more green or blue eggs coming soon. 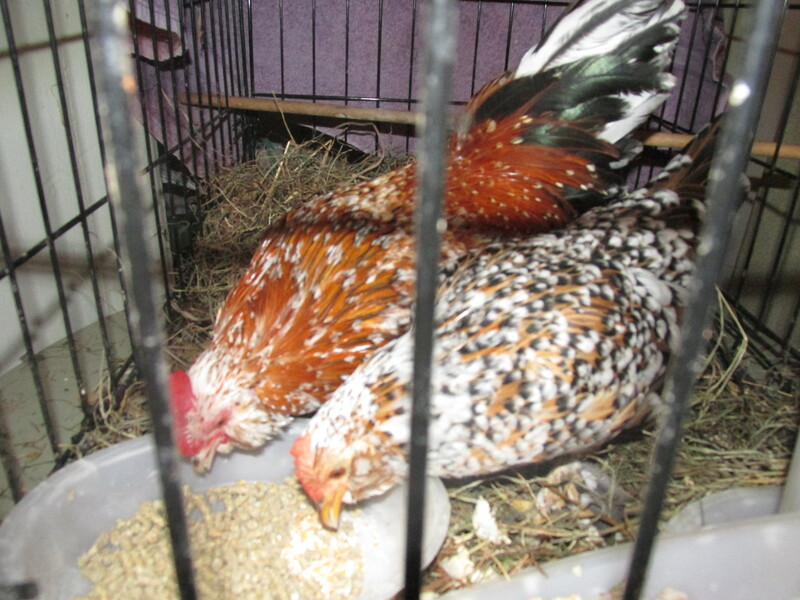 Phoebe is the lighter colored one and very shy so no picture of her today, she is also flighty and Helen is the darker one, she is calm and friendly. Mr. Peppers is on top of the world today! There is a lot of mistakes in this first one but I like how it came out. 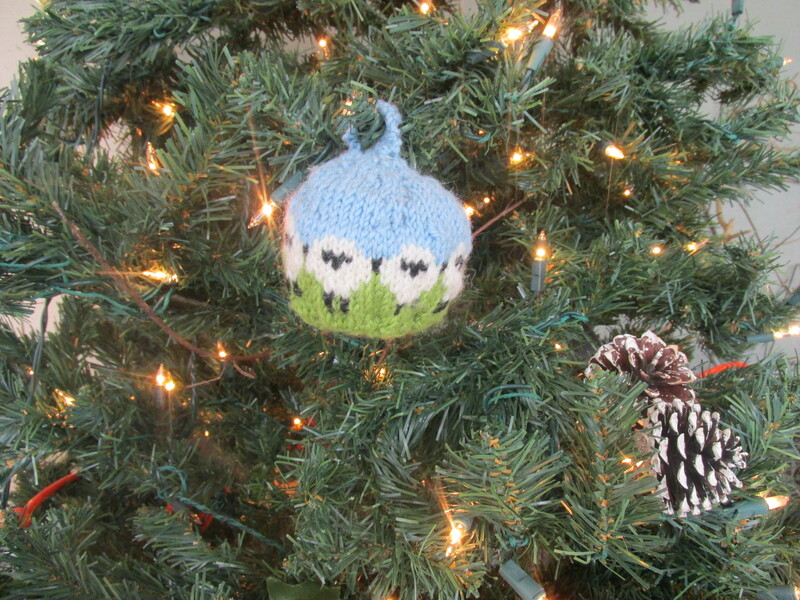 I put cotton stuffing in it and some balsam. I think it would be better if it was firmer though. My friend Vicki has something that is firm and I will try that. I will be going near JoAnns fabric store on the 15th so I may have one half made to see what size of styrofoam I would need if Vicki’s don’t work. I am working on another one now. Will share that one when its done. As I am writing this, the wonderful smell of lemongrass has come up the stairs. 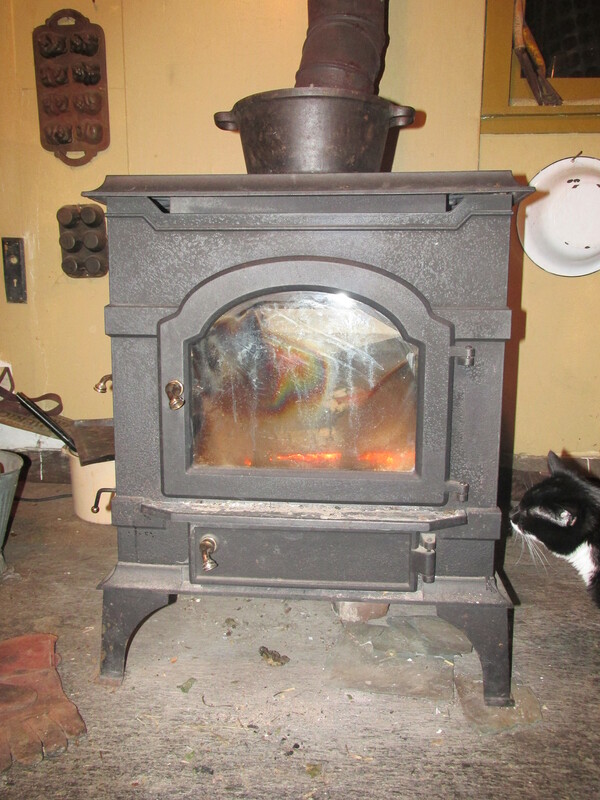 Its bubbling away on the wood stove in the kitchen. 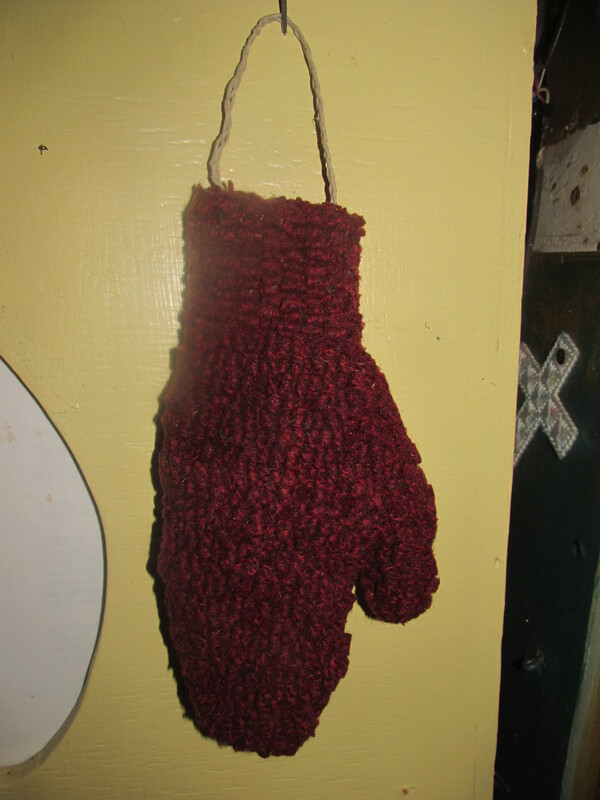 Living in an old house is always interesting. Sometimes in good ways and other times in bad.